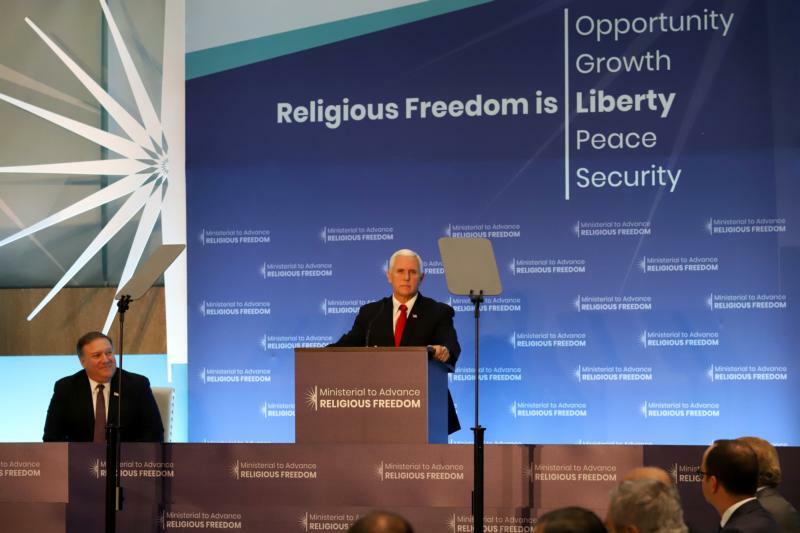 WASHINGTON (CNS) — In a speech at the Ministerial to Advance Religious Freedom, Vice President Mike Pence described the state of religious freedom around the world and the wide variety of attacks it faces. He mentioned several of the guests in attendance who had been the subjects of religious persecution in their home countries. The first individual target of religious persecution Pence mentioned was Father Raul Zamora of Nicaragua, whose church was besieged by the government of Daniel Ortega. In the siege, during which over 200 students sought shelter at the church, two students died, adding to a death toll of over 350 this year in Nicaragua. Pence then discussed religious freedom violations in China and mentioned that Kusho Golog Jigme, a Tibetan Buddhist monk who had been jailed and tortured after speaking out against Chinese rule in Tibet, was in the audience. The vice president said that, in addition to Buddhists, Muslims, especially the Uyghurs in the northwest of China, and Christians also face persecution in China. “But for all of China’s abuses, their neighbor in North Korea is much worse,” Pence said. Pence then described the ordeal of Ji Hyeona, a North Korean who was imprisoned and tortured for having a Bible and forced to abort her unborn child after a failed escape attempt. “Hyeona was lucky enough to escape with her life, and we are honored to have you with us today,” Pence said. He told the story of Nadia Murad, who is Yezidi. “The United States of America, I promise you, will always call ISIS brutality what it truly is: It is genocide, plain and simple,” said Pence, who later in his speech announced, effective that day, establishment of the Genocide Recovery and Persecution Response Program by the U.S.
“Pastor Brunson was imprisoned without being charged for more than a year. And when the Turkish government finally indicted him, they accused him, allegedly, of ‘dividing and separating’ Turkey by simply spreading his Christian faith,” Pence said. He spoke at a reception hosted by the Religious Freedom Institute and the 21st Century Wilberforce Initiative in advance of the State Department’s July 24-26 ministerial. “I am very concerned that India is losing Gandhi’s vision of peaceful coexistence between the Hindus, Muslims, Christians, Sikhs and other minority religions,” Smith said. He expressed concern that, in place of that vision, the idea that national unity requires religious unity was becoming more prevalent. “In at least 10 Indian states, minority religions are being marginalized, harassed, intimidated, and killed — with impunity — by mobs whipped into a frenzy by fake news on social media. Smith also attacked the practice of temple prostitution. He called upon the Indian government to end these abuses and the Trump administration to address these problems. The reception where Smith spoke marked the 20th anniversary of the International Religious Freedom Act of 1998. Smith sponsored the 2016 Frank R. Wolf International Religious Freedom Act to expand on the earlier law and create new tools for the State Department to use to fight extremism and religious persecution around the globe.